CARLSBAD, CA - Private equity firm Littlejohn acquired cabinetry, flooring and countertop installer Interior Specialists, Inc., a Carlsbad, CA provider of interior design and installation services for the homebuilding industry. 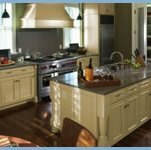 Headquartered in Carlsbad, CA, Interior Specialists, Inc. sells flooring, countertops, window coverings, cabinets and other products to homeowners, then contracts with installers to install the products. ISI sources, stocks and then installs under contracts with national and super-regional homebuilders. ISI currently serves markets in Nevada, Arizona, California, Colorado, Idaho, Oregon, Washington, Virginia and Washington DC.Mostly selling to homeowners through design centers - either ISI-branded or operated on a fully-outsourced basis for homebuilders - ISI recently acquired Las Vegas-based DelGrosso Floor Covering, Inc., a competitor. Steven Raich, Managing Director of Littlejohn & Co., said ISI is "the only large-scale provider of fully-outsourced design centers for homebuilders. With the added support and commitment of Littlejohn, ISI will aggressively leverage this key differentiator and significant value proposition for homebuilders to expand well beyond the company's existing markets." Raich said aquisitions could be on the horizon. Littlejohn is "the perfect firm to work with us as we strategically align with our new and existing customers to build our business on a national basis," says Alan Davenport, CEO of ISI. Littlejohn acquired Northwest Hardwoods from American Industrial Partners in July 2014.